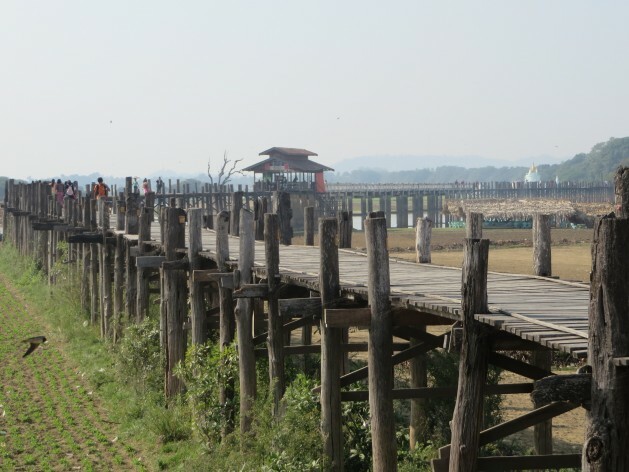 A bridge in Mandalay: rickety infrastructure makes Myanmar prone to greater damage in disasters. Credit: Fawzia Sheikh/IPS. YANGON, Jan 11 2014 (IPS) - As Myanmar nurses a fragile democracy after long years of military rule, a new danger has reared its head. Climate change, say experts, has the potential to spur migration and exacerbate conflict in the country. NGOs point out that more than five years after Cyclone Nargis killed 146,000 people and severely affected 2.4 million, inhabitants of the Ayeyarwady Delta are yet to find their feet. Dr. Lynn Thiesmeyer, vice-president of the Environmental and Economic Research Institute of Myanmar, says the sheer number of livelihoods left in tatters made a rebound difficult. Delta residents who lost farms to salinisation or lost a season’s crop with no money to plant a new one “either subsist on debt or occasional day labour,” said Thiesmeyer, who has knowledge of recovery operations and the status of disaster management plans in the region. Another option, she said, was for family members to move to newly established Export Processing Zones, known as free-trade areas. After Cyclone Nargis, the Myanmar government organised recovery initiatives in the form of community-based projects in many districts, but little could be implemented due to lack of resources, including money and trained personnel, she said. “The government did ensure that everyone received radios and knew how to tune into emergency news. But escape from another storm would still be problematic given that they would need to travel by boat. What they really need is shelters,” Thiesmeyer told IPS. Since Cyclone Nargis – the most devastating natural event for Myanmar in recent years – local and international NGOs have accelerated efforts to counter climate related impacts. The pivotal question is how the next major natural disaster will now affect Myanmar’s social and economic progress, with a civilian government having come to power in 2011. These include coastal erosion, vulnerability to more frequent and severe weather events such as cyclones, extensive and unpredictable drought in the dry zone, and heavy precipitation leading to flooding and landslides in mountainous areas, she said. “We can’t be complacent and we need to prepare,” said Win Zin Oo, humanitarian emergency affairs director at the NGO World Vision Myanmar. The “hard evidence” suggesting the elusiveness and complexity of natural disasters came last spring when Cyclone Mahasen was tracked to Myanmar, he argued. The country was spared the brunt of the damage that was largely borne by other countries in South and Southeast Asia. He said the most prominent hazard within the last two years has been flooding, which hurt local livelihoods and social stability. World Vision offers communities both disaster preparedness and disaster risk reduction (DRR), and has assisted residents affected by Cyclone Nargis, the Shan State earthquake, the Ayeyarwady flood and the Kayin State flood. Win Zin Oo said that after the Nargis disaster, his NGO realised that aid coordination among response stakeholders is still challenging, but DRR, including community-based initiatives, may significantly curb the negative effects of climate-related events. According to Dear Myanmar, a Yangon-based NGO focused on environment-friendly agriculture, the main roadblocks to adequate preparation include the lack of meteorological news in the country, limited advance warnings, and the failure of some residents to consider disaster forecasts seriously. Yarr’s organisation, along with a Yangon-based NGO called ALARM, offered a programme known as the Myanmar Leadership Institute on Climate Change last February to 45 government officials from 12 different ministries and departments. Homegrown organisations and institutions are trying to boost the country’s resilience. At the government level, Myanmar chose the coastal provinces of Tanintharyi and Ayeyarwady in December for a pilot project to integrate disaster and climate risk management into regional development plans for 2014-2015. Dr. Win Myint, director of the NGO Environmental & Economic Research Institute in Yangon, also initiated a revitalisation project after Cyclone Nargis to support farmers with technology and rehabilitate damaged soil. Working with the Asian Institute of Technology, administrators of the programme chose nine families in 11 villages, targeting landless, poor residents and women in particular. Some wanted to raise pigs or livestock to sell, or to fish for shrimp or grow vegetables, he noted. The NGO then offered the families training and materials to fulfil their goals. In another example of an NGO aiding local livelihoods, Dear Myanmar has been promoting sustainable agriculture among the farming community. The organisation offers a monthly knowledge-sharing programme that teaches farmers how to use organic fertiliser which, it argues, is better than methane producing chemical pesticides that harm soil quality and hasten climate change. Chemical fertiliser gets washed away during severe weather and is not conducive to food security for the local population, Nyan Lin, founder of Dear Myanmar, told IPS. The devastation brought on by Cyclone Nargis forced the Myanmar government to accept international assistance. Experts argue that it also mobilised local actors to play a crucial role in strengthening the state against catastrophe. Despite these efforts, the final report of George Washington University’s Myanmar Leadership Institute on Climate Change offered a caveat: “Climate change is a new and unpredictable threat to the transition process.